Basingstoke, 4th April 2019 – Videe, an Italian company with over 30 years of heritage in offering worldwide broadcast and events solutions, has acquired 16 of Sony’s PXW-Z190 professional 4K handheld camcorders to film the popular survival reality TV show, Isola dei Famosi, known internationally as Celebrity Survivor. The show itself was filmed in the challenging conditions of Cayos Cochinos – two remote islands in the Caribbean Sea off Honduras. 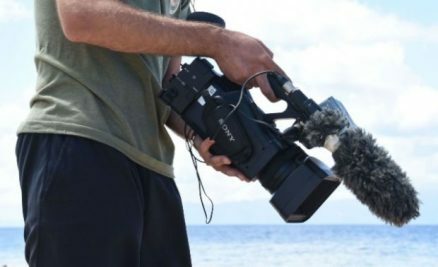 Videe chose the state-of-the-art PXW-Z190 camcorder, following numerous technical tests, to enable it to continue creating high-quality 4K live productions even when competing with heat, sand and salt in the environment. Having launched at NAB last year, Sony’s ultra-compact PXW-Z190 4K camcorder is highly reliable and offers wireless capabilities along with advanced workflow functions, providing Videe with a simple, flexible and cost-effective solution. Furthermore, the camcorder’s 4K 1/3-type 3CMOS sensor delivers exceptional image quality while offering 4K 50p/60p shooting with a powerful 25x optical zoom lens. The artistic possibilities the camcorder unlocks enabled Videe to capture and convey the close personal drama of the reality TV show’s characters, alongside the show’s expansive and exotic backdrop. Sony’s unique Electronic Variable ND filter also gave Videe the ability to be agile in its shooting, enabling its team to seamlessly livestream Isola dei Famosi from the far reaches of the Caribbean Sea. The camcorder’s Dual MI Shoe further enabled the simultaneous use of wireless audio and video lighting which is of great importance given the show is shot in challenging light conditions, from dimly-lit interiors to the intense brightness of a sunlit beach. Additionally, shooting in 10-bit 4:2:2 mode ensured vivid and colourful HD content. Harnessing the power of these features allowed Videe to capture the rich experience of a Caribbean adventure and share it with millions of viewers at home. « We have been committed to using Sony’s solutions for a number of years now, given they are synonymous with quality and cutting-edge technology. They provide us with the essential tools we need to meet the excellent standards we pride ourselves on at Videe, » explained Bruno Mercuri, President and Commercial Director of Videe. « Today, one of the biggest challenges within the broadcasting industry is to create high-quality content while keeping production costs to a minimum. The PXW-Z190 ultra-compact 4K camcorder improves flexibility and efficiency within the production workflow and is ideal for overcoming the environmental challenges such as those in Honduras, where light is very bright, the heat is intense, and the equipment is continually exposed to sand and salt,” explained James Leach, Product Manager of Sony Professional Solutions Europe. Thanks to the instant HDR feature, the new PXW-Z190 model captured breath-taking images without the need for additional colour grading – saving valuable time during production. The integrated 25x optical zoom lens and Advanced Face Detection Autofocus (AF) was also vital when capturing the dramatic debates between the show’s castaways. If you want to learn more about Sony’s live production solutions, please visit us at NAB 2019, Stand C11001 at Central Hall, C-5, Las Vegas Convention Centre from 8th to 11th April 2019.